The Laboratory for Imaging of the Mining Environment (LIME) was established in 2010 as a joint initiative between the School of Minerals and Energy Resources Engineering and the former School of Surveying and Spatial Information Systems (SSIS). 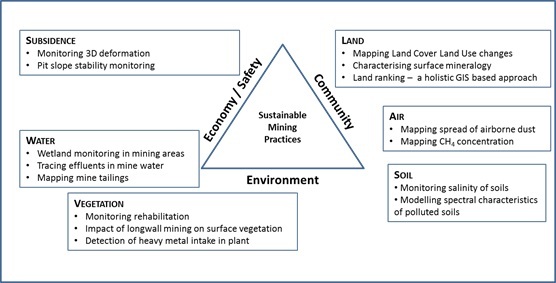 LIME is engaged in developing applications of remote sensing for mining (Figure 1) by using satellite based, airborne, UAV based and ground based sensors. Various LIME projects have utilised satellite images from various government space agencies including European, Japanese, Italian, German and NASA as well as images from commercial satellite operators such as DigitalGlobe. LIME research is spread all along the electromagnetic spectrum and deals with both active and passive remote sensing.